Christmas is almost here! And that means people will be traveling to see family. We will not. We're staying put. My husband is in the military and getting leave can be tricky. But a lot of people ARE traveling, and some of those people have kids. Let me tell you, being in a car with a child is not my idea of fun unless you can afford a nanny. I cannot, so I have tips on how to make things smoother. 1. Get some ear plugs. If your kid is older than 5, you don't need to listen to their whining if they won't stop. So get some ear plugs. Inform your kid that unless they can behave like a proper human being, that you won't be listening to it. 3. Don't worry about screen time. People freak out about this because experts tell them to. Seriously, if your kid is quiet, let them watch a movie or play on the iPad. 4. Put on your music. Not that kiddie music nonsense. I mean, it's YOUR vehicle. Why should you be tortured with The Wheels On The Bus? Jam out to songs you listened to in high school. Hello Green Day! 5. 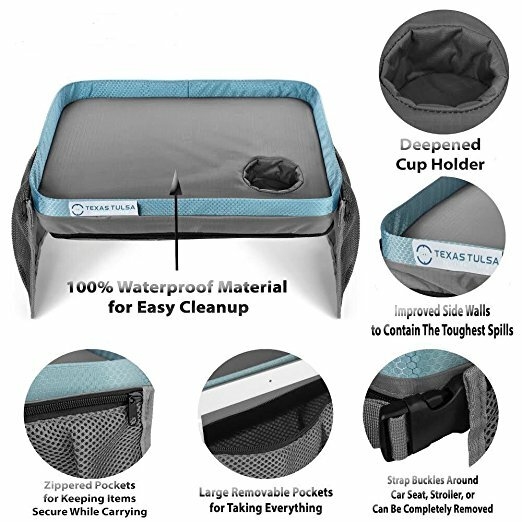 Get a travel tray from Texas Tulsa Connection. 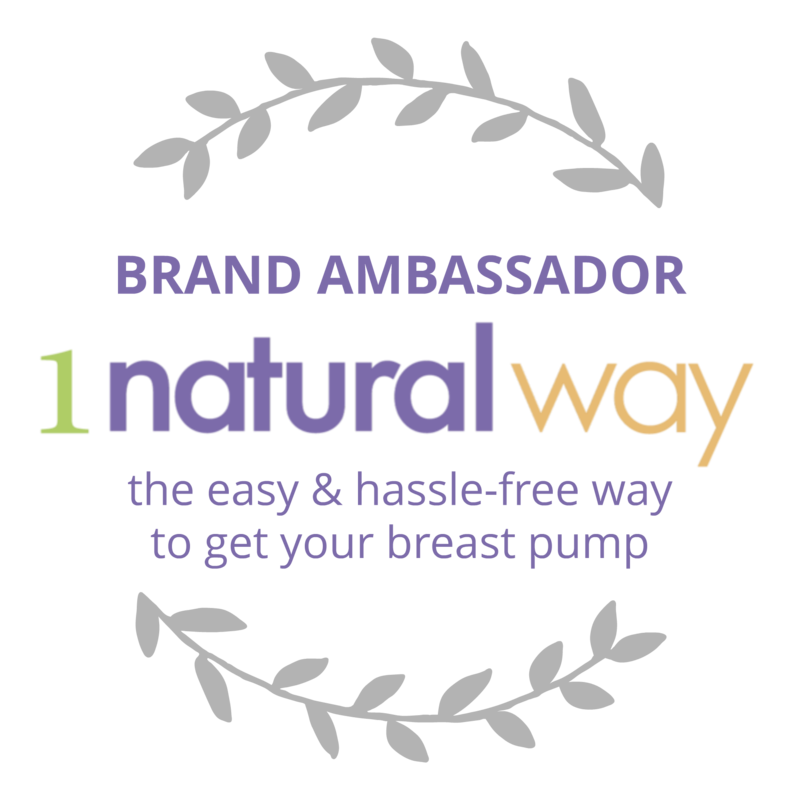 They are a family owned business, so you can feel good about your purchase. And I can tell you, this tray works well. 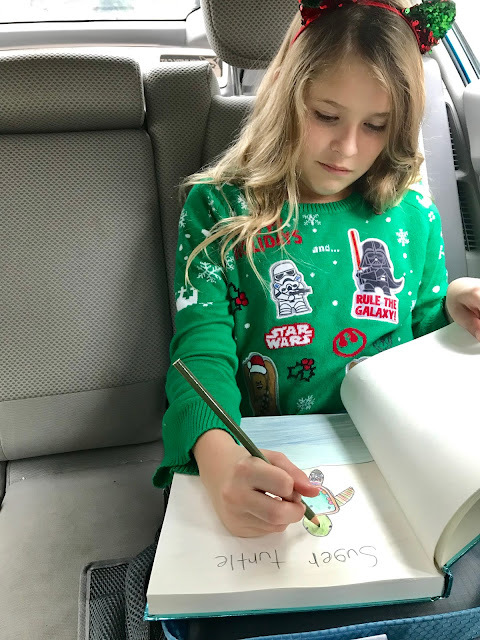 Natalie loves that she's able to draw and that there's a cup holder. It's sturdy and is basically already set up when it arrives. You can buy it on Amazon for under $20! So if you're traveling, be sure to pick up the Travel Tray! Have you ever traveled with children before? How did you cope? Or maybe you've only traveled with a man who behaved like a child? You can learn more about Texas Tulsa Connection on their website, Facebook, and Instagram. So funny!! I’m the crazy one who likes listening to kids nonstop. I make the kids put down the iPads when I nanny them and hang out with me lol. I wish I read this last year, we went on a road trip and did not plan it properly, we forgot so many things and let's just say it was memorable. Thank you for this in case I choose to go on another trip. It's really hard to last long during a trip with kids if you don't prepare beforehand. Those are some great ideas, probably best if you brought things that entertain them. The travel tray would really make life easier when road tripping. When the kids were little, we'd travel to my mom and dad's every Christmas. Now that we have grandkids, we stay put. These are all great tips. Snacks tons of snacks need to be packed. We let them watch movies with headphones individual that way everyone gets to watch their own movie. Music helps as well. I remember when i was a kid and my brothers and I were all in the car. So much noise! My poor parents! but a movie and it was all good! Yep, screen time goes out the window when you are on a road trip. That tray looks really handy! Those are helpful ideas for traveling with kids. I liked that the travel tray comes with a travel pillow. We are going on a road trip today so this will be very helpful. I love the idea of the travel tray and the pillow. I know my kiddo I would like that. We definitely throw out the screen time rule when we travel, too. Although, it is really fun to turn off the electronics and play some old school travel, games. Have fun holiday travels! This is definitely tested and proven. I know, not because I have kids but bec I have lil brothers! Lol thanks for sharing! Helpful for the holiday travels! I wish there were awesome travel trays like the one in this post when my daughters were growing up. That would have been a game changer. We would buy learning toys like LeapFrog to help the girls pass the time while traveling in the car. Happy holidays to you and your family! i love lookin at ur photos, always funny and sweet and im not much of a road tripper but i can use the tray for sure! awesome item i think! I never leave home without games, snacks, and movies for road trips. That pillow looks nice too, I bet the kids would like that. That travel tray looks awesome. I am so relieved to be staying home for Christmas LOL! Snacks are always important on a family road trip. I think that lap tray for kids is really cool. This is really nice! My son and I (plus the dog) are often on the road back to my home town. This looks like something he'd like. He doesn't like the same music so the earplugs are a must. I've always loved traveling with my boys, they were always well behaved. I think tables in the car are fine if it's a long drive and the kids want to watch them. I need a tray for me! Scarlet can't do the iPad in the car. That didn't end well last time. So we need your other tips! I always pack a bunch of snacks for road trips. I try to pick up a new game before we leave for the kids to play. The travel tray from Texas Tulsa Connection would be perfect. I will have to add it to my shopping list. I dont have kids, but I've definitely been in cars with friends and their small children. And music and movies are a must to keep them entertained. That and plenty of games. I need the Texas Tulsa Connection since my backseat covers block my access to the built-in tray in the backseat so this would be perfect. I have a toddler so I guess this is for me. I like all of this and the ear plugs are the best. Thank you for sharing these. I think the best way is to bring games and snacks. It's the best way to divert their attention. Road trips are great fun. 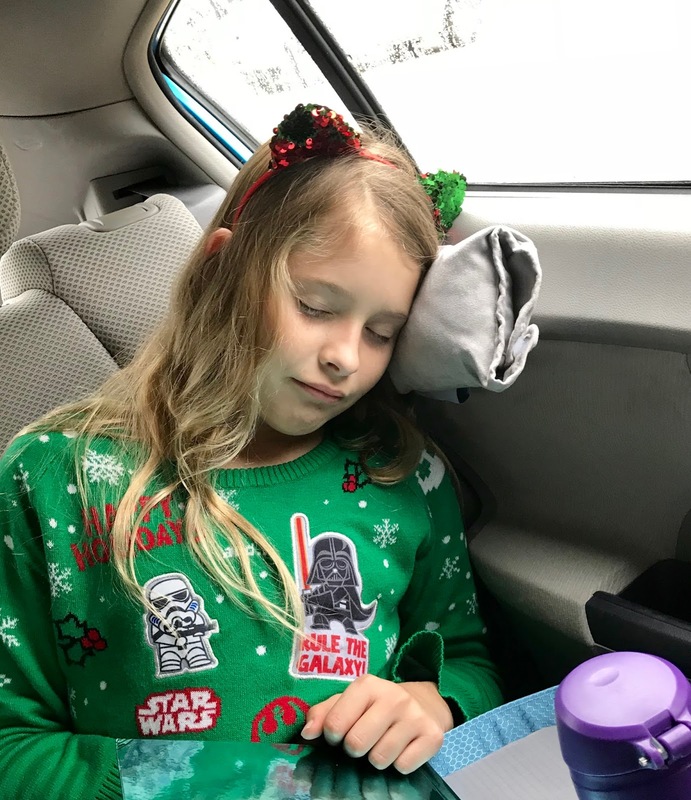 But if you are traveling with kids and especially on long trips, this can be a challenge and ensuring that the kids do not throw tantrums and are occupied becomes an issue. These are some practical tips on ensuring a smooth trip. This sounds like some great tips, I can imagine it can be hard going on a road tip with kids, I always find being in the car very boring unless I'm driving. When my son was little, we brought along a portable DVD player. It definitely helped! We also stopped frequently and divided the trip up into two days, even if we could make it in a day. We allow screen time when traveling. Sometimes we are all exhausted and that is the easiest way to calm the kid. 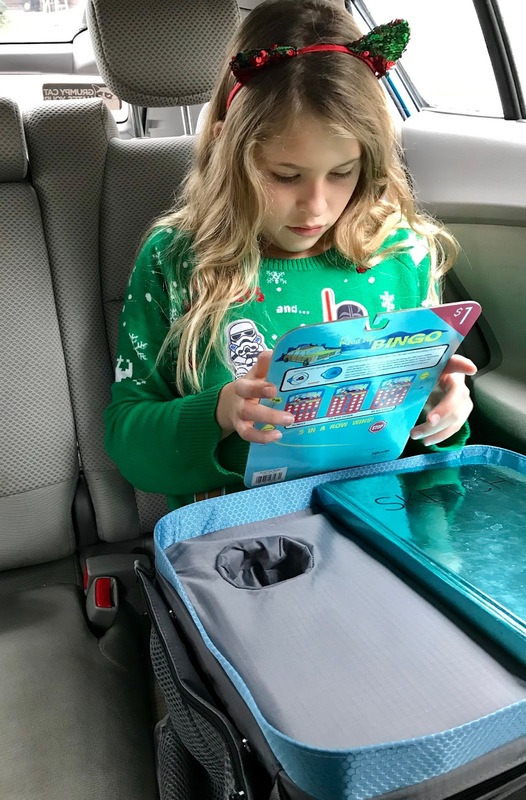 The travel tray looks fantastic gadget for kids! That they can use as table and pillow to sleep on. What a functional gadget for long road trip! That travel tray is all sorts of awesome! We do a lot of road trips I think I am going to have to grab a couple! Roads trips are hard for kids and adults! 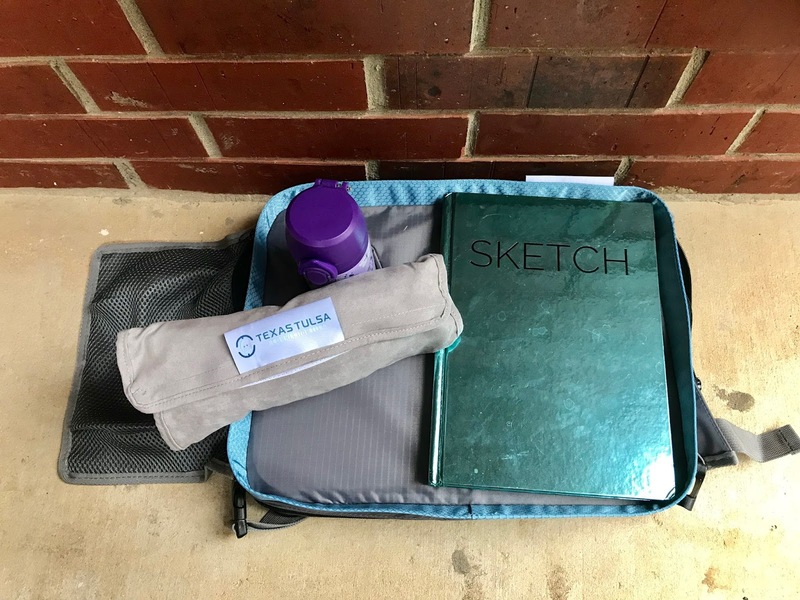 I love the travel tray from Texas Tulsa Connection, that's such a good idea. Will have to invest in one for my SUV. What a great tray! That's an awesome idea. I also recommend headphones if you have more than one kid. I got so tired of hearing the kids whine about hearing each other's music/movies/etc, or how they were trying to sleep while the other one was listening to something. These guides are spot on and we do similar things when we go on a roadtrip. I would like to get that travel tray. These are great tips! 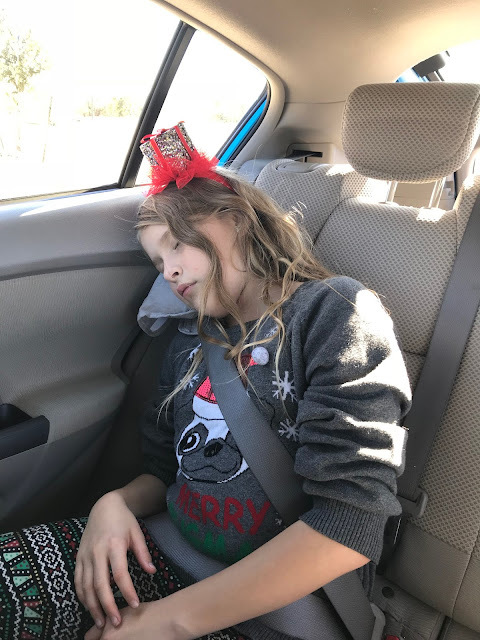 My daughter is 2, so she’s still not at the “hard to travel with” stage; she typically falls asleep in the car. I do know that she does well with watching videos on the iPad (no guilt here!) and when snacks are packed. I love that travel tray! These are really great tips for the "are we there yet" trips! I love that travel tray! I can only guess how challenging it is undertaking a road trip with kids. These are all great suggestions and ideas for a perfect road trip! Lol great tips, I really love the photos going along with this post. creative and lovely! Thank you! These are some great tips! 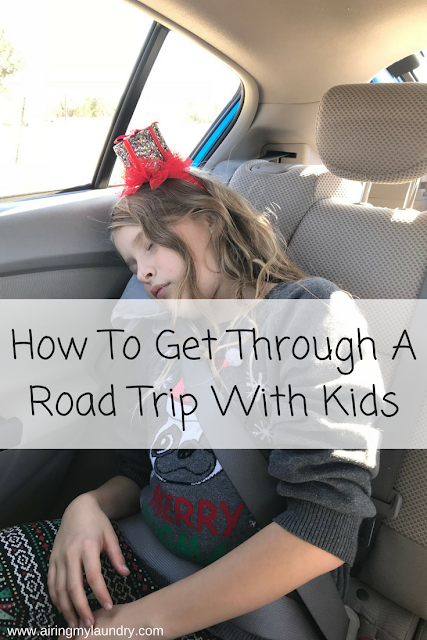 Long road trips with the kids drive me crazy so the more prepared I am the better!